This is the look of *get me home now* before I shoot my face off look after having all four wisdom teeth pulled out. Looks like I just stuffed my lip with chewing tobacco. 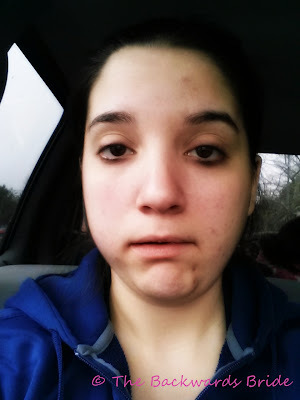 My surgeon didn't knock me out, but numbed my whole mouth. Numbing was the worst part with all of the needles. OUCH! The top two teeth were easy peasy. The bottom teeth were impacted so he had to cut through them to take out. All of the cracking sounds made me feel a little uneasy but every time I was asked if I wanted a break, I just wanted it to be over with. The tooth on my lower right side was a such a pain. I could still feel pain when he was trying to cut through it so they had to keep stabbing me with anesthetic. All in all I'm such a baby with a hard head and a trooper state of mind. Does that not make sense? I'm sure. The first 24 hours I was on pain killers but today I'm fine.. I ate a ginormous brunch and hoping to get back to working out tomorrow, HOPEFULLY! I can only imagine the pain you’ve been through, Stephanie. Looking back, my wisdom teeth have brought me some not-so-pleasant memories – from the extracting itself to the recovery. >.< We’re lucky we didn’t develop any infection, whatsoever. I’m sorry to read that you were awake throughout the experience. When I had mine removed, I specifically asked to be put to sleep since I was not, and still am not, a pain person. Anyway, it’s always the first few days that hurt, plus the swelling makes us not want to be seen by anyone. I hope that you were still able to work as you had planned!